Kale is coming up in my spring garden, and it is one of my all-time favorite green veggies, any time of year. I started my seeds a little early this winter, and with the mild weather we had, it worked out perfectly. Well, perfectly except for the squirrels, who have a penchant for digging out the acorns from the soil around the plants, and nibbling the tender kale leaves before I can get to them. Ecodaddy makes them an “offering” of sunflower seeds every morning, but I’m not so generous. I think he’s caving and paying off mafia rodents. Little pests. The grey, rainy day today made me crave something warm and nourishing for dinner, like a soup or a stew. With an abundance of kale from my last coop order, plus the bounty that’s been coming up in my garden, I was looking for a way to use it, quick. 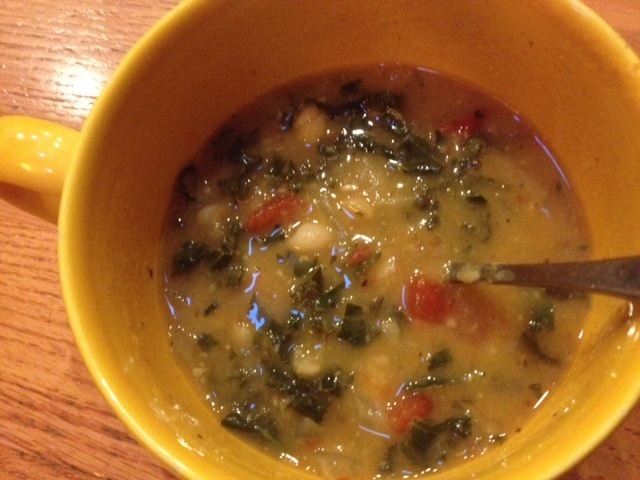 A few small adjustments to this recipe, a couple of extra hours to cook the dried beans, and voila: I had a healthy, delicious, soul-warming soup that used up my kale and pleased the masses! Rinse and pick over white beans; place in pot and cover with water by several inches. Bring to a boil, then turn off heat. Allow beans to sit for one hour, then discard soaking water. Return beans to pot, add 1 tsp sea salt and stir. Bring to a boil, then lower to a simmer and place lid half on. Stir every 10-15 minutes, and let simmer for 1.5-2 hours until desired tenderness. In a large soup pot, heat the olive oil, then sauté onion til translucent. Add garlic and sauté for one more minute. Add kale, toss to coat with oil, and sauté, stirring, until leaves are fairly wilted, 5-10 minutes. Add a tiny bit of broth as you stir, to keep onions and garlic from burning. Add 4 cups of broth, 2 cups (or one can) of cooked beans, tomatoes, herbs, salt and pepper. Simmer 10-15 minutes. In a blender or food processor, combine remaining 2 cups broth with 2 cups beans (or one can) and blend to an even consistency. Stir into soup and simmer 15-20 minutes more. Ladle into bowls and top with grated parmesan cheese, if you so choose. For the kids, I poured the chunky soup back into the blender and pureed it. While it wasn’t the most appealing shade of green, it was quite delicious, especially topped with parmesan.